The Little Dipper on Cherokee Street is getting new owners. Jason Paul took a leap when he opened the Little Dipper (2619 Cherokee Street; 314-652-3230) sandwich shop last February, leaving behind a well-paying, 9-to-5 gig in the soap business. On November 1, he's making another big change, selling his freshman restaurant venture to acquaintances John Buehlhorn and Laura Sisul. Sisul is well-known to music lovers as the lead vocalist of Stella Mora and managing partner of the Ready Room; Buehlhorn has been bar manager at Felix's. Originally conceptualized as a food truck, the Little Dipper was the brainchild of Paul and his business partner (and bandmate) Thomas Eversmann. 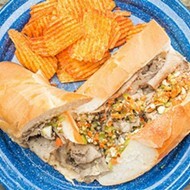 In the eight months since opening in the shotgun space on Cherokee Street, the tiny shop has become a neighborhood mainstay, known for it's Italian beef sandwiches and weekend night street-side pop-ups for bar patrons and concert-goers. However, Eversmann's amicable departure in July left Paul shouldering 100 percent of operations for the restaurant. When his father approached him about a yet-to-be-disclosed business opportunity in Illinois, Paul knew that he could not do both. "My father and I had been working on this thing before I opened the Little Dipper," Paul explains. "When it didn't look like it was going to go through, I went ahead with the restaurant. Now, the opportunity has come up again, and it's something that I really want to do." Paul thought he would be able to pursue the venture with his father by taking on a partner at the Little Dipper. "I let people know that I was looking for someone, but that never worked out," says Paul. "I also thought about just hiring someone to work for me — to do what I was doing — but I'm very hands-on. If I wasn't here every day, I couldn't make sure that the person would be upholding my standards. It would've driven me nuts." Though it occurred to Paul to sell the business outright, he wanted to make sure he found the right ownership fit. "There was no way I was going to simply sell it." Paul says. "I've worked too hard for that. Then my girlfriend Corey [Hammerstone] ran into John and Laura at the bar where she works. They mentioned that they were looking to open a place like the Little Dipper. She called me right away, and we started talking about them buying it." Paul notes that Buehlhorn and Sisul are the only people he seriously approached about buying the Little Dipper. "Once I sat down with both of them together and we started talking, I knew this was the right fit, he explains. "I had a lot of confidence that they wouldn't change the place." 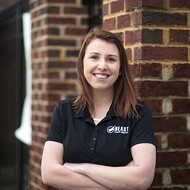 Sisul emphasized to Paul that she did not want to be the sort of new owner who comes into an existing restaurant, makes changes and runs things into the ground. Instead, she and Buehlhorn intend to keep things, for the most part, as they are, including all of the recipes. "Hearing Laura talk — she has such good business sense — made me wish I would've had her here from the beginning," Paul laughs. Buehlhorn and Sisul assume ownership on November 1, though Paul will remain on through the month to train the new chef and aid in the transition. Though he is excited for the new chapter with his father — and the bigger kitchen it will hopefully provide — he admits the departure is bittersweet. "I'm sad for sure. I mean, I spend every day here. I'm more comfortable here than I am in my own home," Paul says. "But I see how connected John and Laura are to the neighborhood and the fire they have in their bellies. It makes me think that this could be really good for the restaurant."